Day 1 – Benvenuti a Roma! 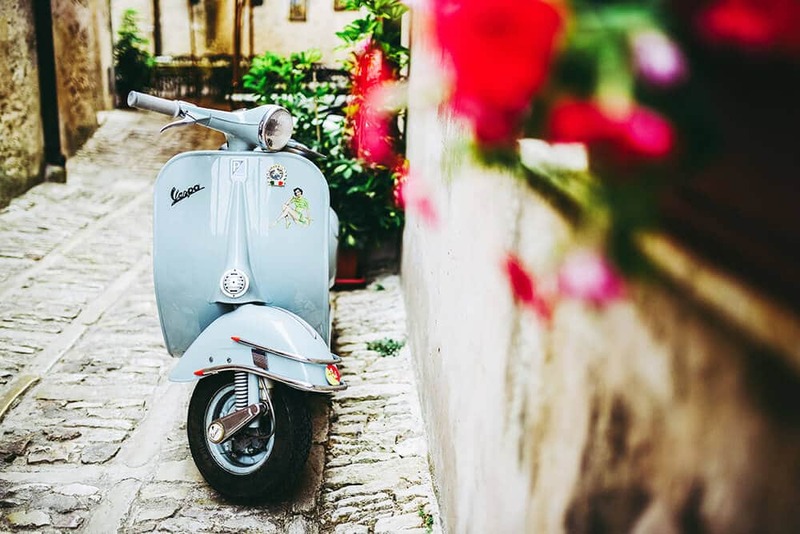 Did you know that you can explore Rome also riding a vintage Vespa? That’s so “Dolce vita”! 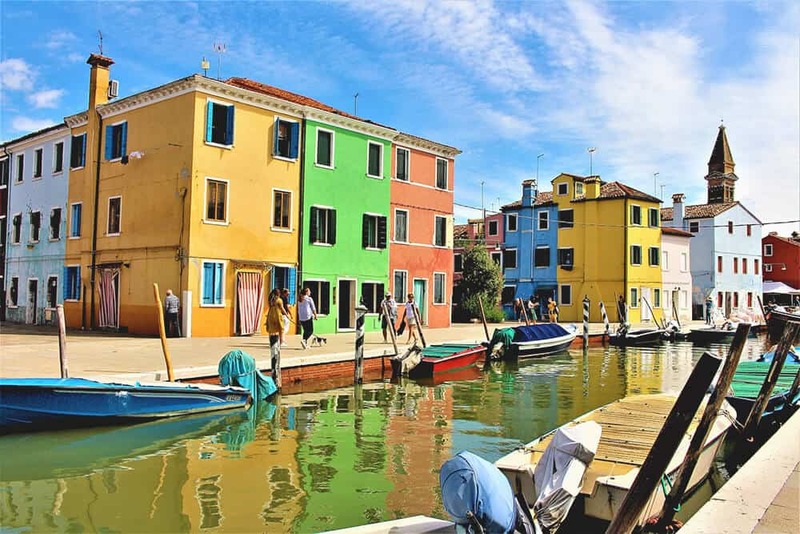 If you’re visiting Italy to get a taste of “La Dolce Vita“, you’re in the right place. 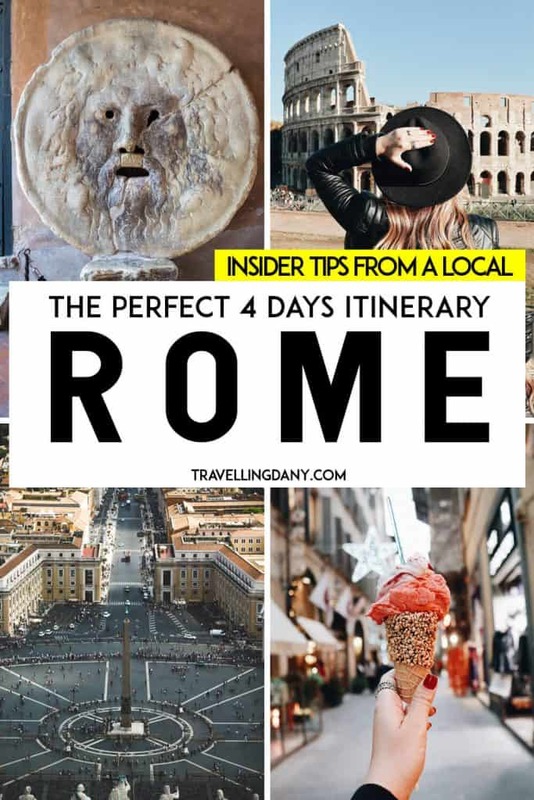 Being an Italian in love with her Country I prepared for you a Rome itinerary for 4 days of fun, culture, history… and of course good food! I think 4 days are enough to see a lot, without having to rush your visit. 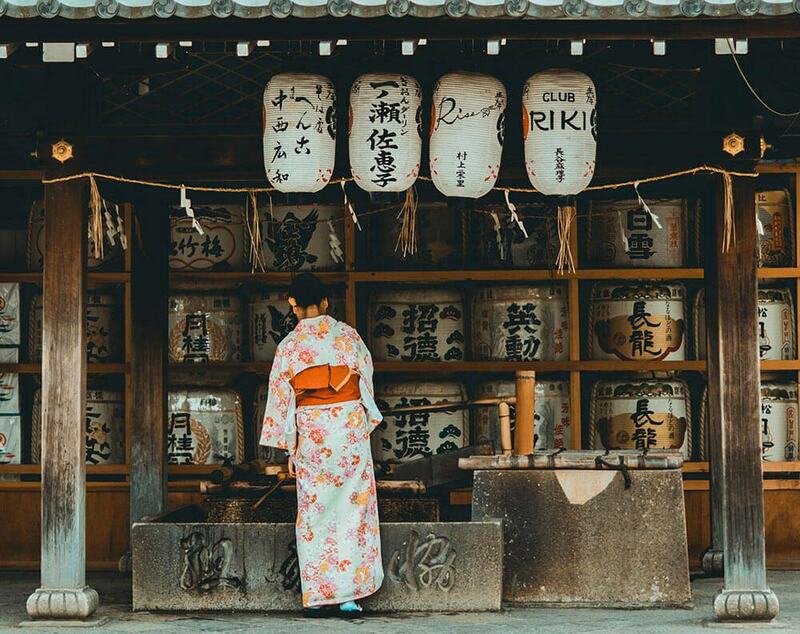 This itinerary will also include the chance to experience one or more day trips from Rome and of course a visit to Vatican City, the smallest Country in the world! Check out my list of the best Italy itineraries for more info on where to go from Rome, in case you’re spending more time in my Country! Welcome to your first day in Rome! According to when you are arriving and to how tired you are, my first suggestion is to start by visiting the symbol of the Eternal City. The Lupa Capitolina (Capitoline Wolf) is a sculpture depicting a scene from the legend of the founding of Rome. 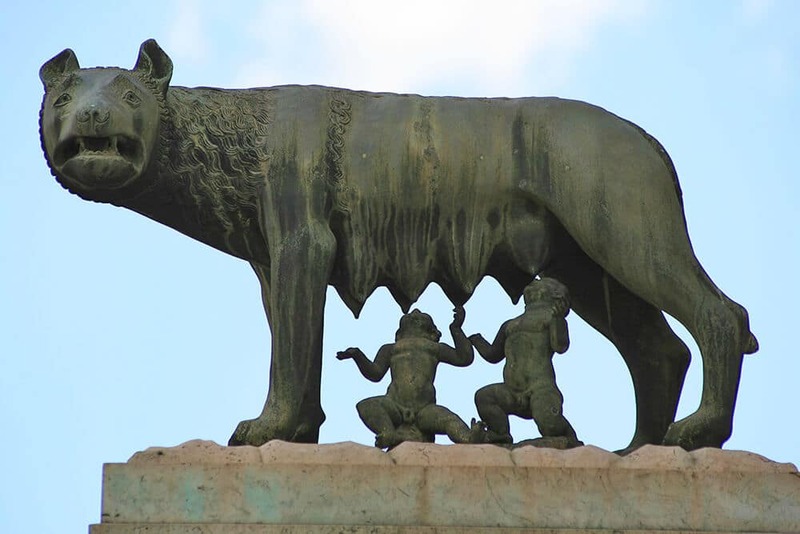 The Lupa (she-wolf) is suckling Romulus and Remus, the two founders of Rome. According to the legend, when Numitor, grandfather of the twins, was overthrown by his own brother, Amulius, the usurper ordered them to be cast into the Tiber river. The she-wolf rescued them and cared for them until they were found by a herdsman, Faustulus. While there’s a bronze sculpture at the Capitoline Museum, you can see a smaller copy for free on the left side of the Campidoglio (Capitolium). It’s located on a column with her back to the Fori Romani (Roman Forum). What better way to start our 4 days in Rome? 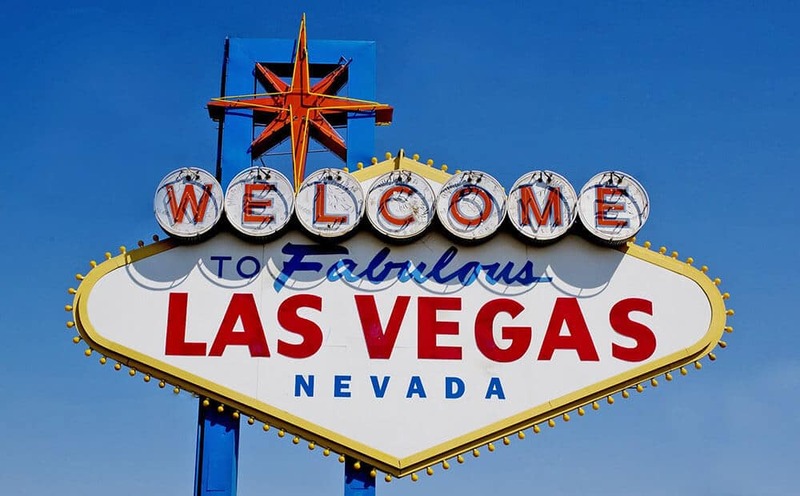 Are you visiting in the warmer months? Find out what to wear in Italy in summer to make sure you pack right! You are in an area full of things to see. Piazza del Campidoglio is one of the most important squares in Rome, designed by Michelangelo. In case you got here quite early, you might be able to visit also the Capitoline Museum. Tickets cost 14€ and the museum is open every day, from 9:30 am to 7:30 pm. Some guided tours also let you visit the Colosseum underground! Afterwards (or as an alternative), hop on a metro (the best way to see Rome is by using the metro, because there’s always so much traffic and the buses can be very slow or they might not show up at all): your Rome sightseeing for the day isn’t over! Your next stop will be the Colosseum. You can visit this world-famous amphitheatre with a guide. Tickets for a self guided visit cost 9€ (4,50€ for kids, free for all the Italian citizens under 18 years). There’s an additional ticket of 3€ to see also the exhibit. 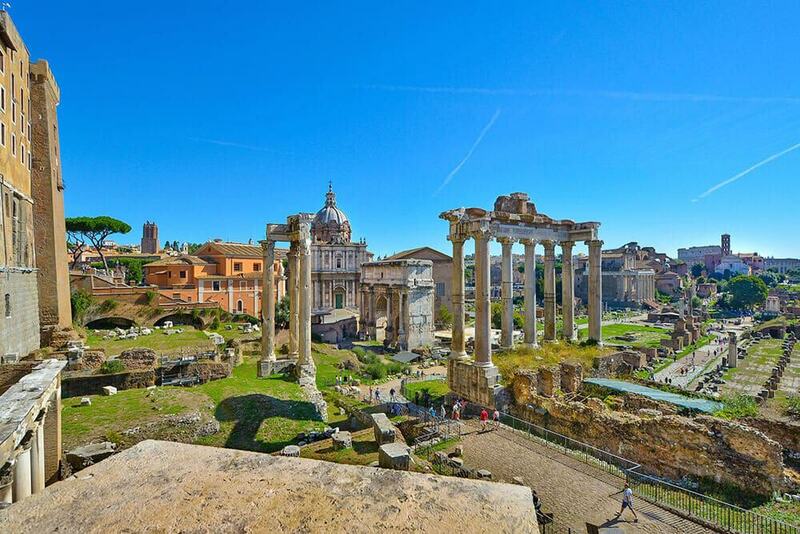 The good thing is that you can use it for two days and it allows you also to access the Roman Forum! 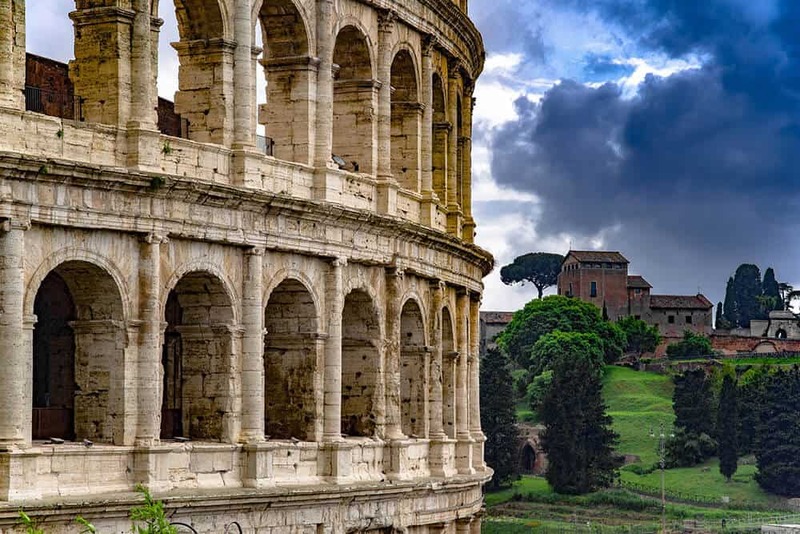 If you’re planning a trip to Rome almost completely dedicated to history and culture, be aware that you can buy a SUPER ticket. It costs 18€ and it includes 1 entrance to the Colosseum, 2 entrances to the Roman Forum, all the exhibits (aside from the optional one), 1 entrance to the Palatine Museum, and 1 entrance to the Cryptoporticus of Emperor Nero. The SUPER ticket is also valid for 2 days. Since you’re within walking distance from yet another very cool must see in Rome, let me introduce you to yet another legend. 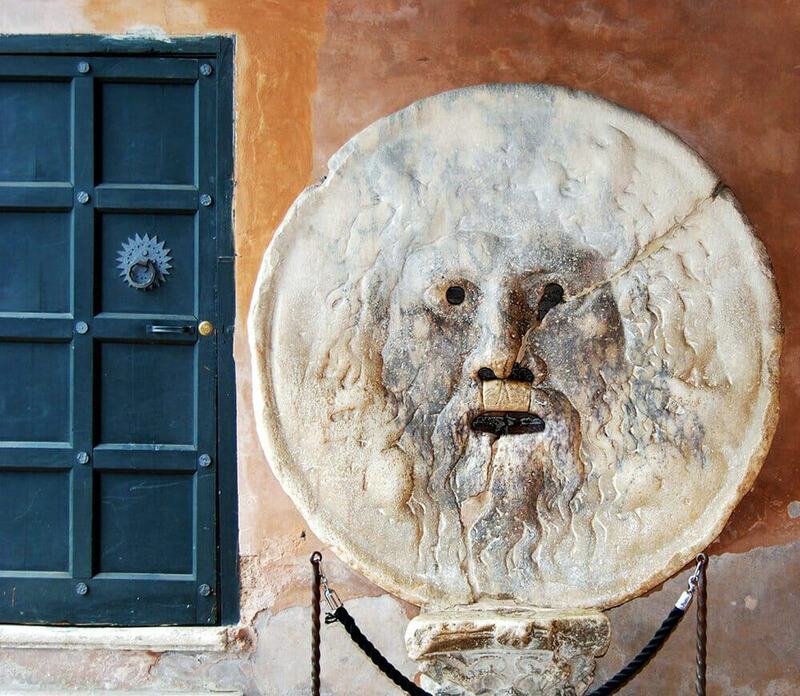 The “Bocca della Verità” (Mouth of Truth) is a huge stone mask that represents a man with a beard and his mouth open. It became famous thanks to the movie “Roman Holiday” (1953) with Audrey Hepburn and Gregory Peck (the one where they ride a Vespa in Rome!). According to the legend, if you lie when you put your hand inside the mouth, the mask will “bite you“. You can try your luck and take a picture for free, in Piazza della Bocca della Verità 18. Beware: there’s always a long line of tourists waiting to take a picture with their hand in the Mouth! In the colder months you can access from 9:30am to 4:50pm, in summer time it stays open until 5:50pm. Are you absolutely ready to put your hand in the Mouth of Truth? Museums are not your things? No worries! You’re pretty close to yet another must see in Rome. Take another metro to the Basilica di Santa Maria in Aracoeli (Basilica of St. Mary on the Altar of Heaven), near the Altare della Patria (Vittorio Emanuele II Monument). The Basilica is truly beautiful and the entrance is free, so by all means, stop there to have a look! 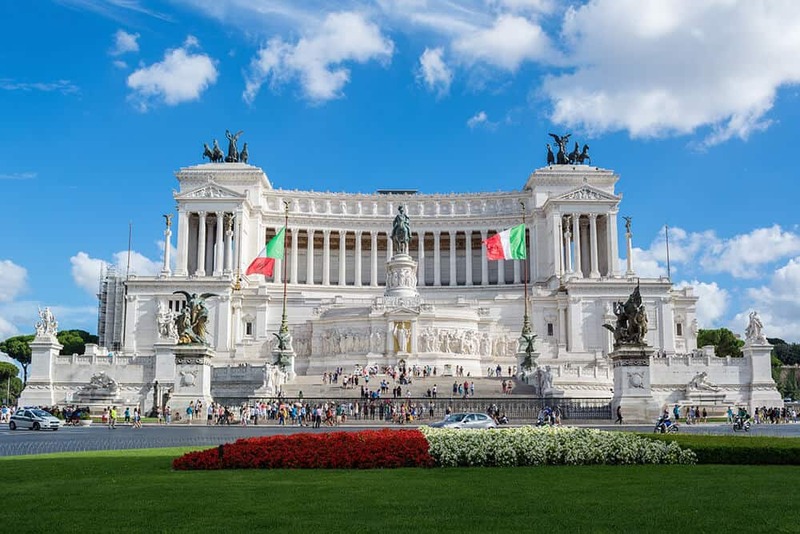 Our Altare della Patria is a monument built in honor of Victor Emmanuel II, the first king of the unified Italy. It holds the Tomb of the Milite Ignoto (Unknown Soldier), where the eternal flame is always lit and guarded by two soldiers. This monument is one of the most important ones in the history of Italy. You can take pictures and visit the outside for free (please, be respectful). Paying the 7€ ticket to access the terrace will reward you with one of the most beautiful sights in Rome. From there you can take amazing pictures of the city seen from above. You’ve had a long day and I’m sure you’re dead tired. So for your first night in Rome I suggest you find a restaurant (here you can find a handy guide to Italy tipping with Italian sentences you can use) within walking distance from your hotel. You’ll have plenty of time to explore more tomorrow! Please be respectful when you visit the Altar of the Fatherland! La Dolce Vita is an Italian movie by the world famous director Federico Fellini. It is about Marcello, a journalist writing for gossip magazines, and his journey through the “sweet life” (in Italian it’s “dolce vita”) of Rome, looking for happiness. This movie became famous for the scene in the Trevi Fountain, when Anita Ekberg walked into the fountain, trying to tempt Marcello (Mastroianni) to follow her. What not many people know is that the scene was shoot in winter and the water was freezing! That shouldn’t be a problem to you, since you’ll visit the Fontana di Trevi without jumping in (please, don’t do it, it’s against the law!). Your best bet is to get here very early in the morning, so you can take pictures with a beautiful, natural light (I used this hack a lot when walking through the nicest photography spots in London). Some people also visit late at night, but because this area is full of cafes and restaurants, you can’t be sure that there won’t be other people. Also… I’m biased maybe but I think the fountain is at its best during the day! Unless you want to use your 2-days ticket from yesterday to go to the Roman Forum, or if you want to visit the Pantheon, this Rome itinerary will go through some of the most iconic spots in the Italian capital. The Trevi Fountain sure is one of the most instagrammable spots in Rome! From the Trevi Fountain you can just walk towards the famous Piazza di Spagna. As you stroll through Largo del Tritone and Largo del Nazareno (take a lot of pictures of the beautiful architecture in this area! ), by all means, enjoy a delicious Italian gelato! If you’re hungry for a savory snack, see if you can find a slice of “Focaccia romana con mortadella” to get a taste of Italy! It’s a famous Roman snack, soft bread with raw salt on the top and filled with a slice of mortadella, a large Italian sausage of cured pork. Be aware that Focaccia can’t survive super long trips so it might not be the best souvenir from Italy! Piazza di Spagna is where the famous stars are located. You can sit there to have your snack! At this point you have two options. If you want to enjoy a nice day in the biggest park in Rome, head over to Villa Borghese. 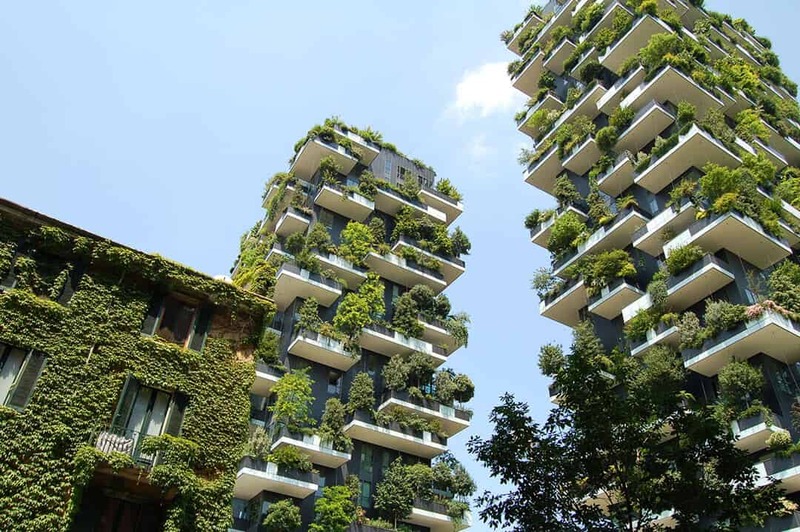 You will be able to visit a lot of monuments: think of it as… the Italian version of Central Park! If you want to keep exploring the Dolce Vita, then from Piazza di Spagna walk to Via dei Condotti. It’s the narrow street you see on the other side of the square from the stairs. Deep breaths, it can be overwhelming: before you enter Via dei Condotti, it’s better if you hide your credit card or hand it over to a trusted friend! La Dolce Vita in fact is here! 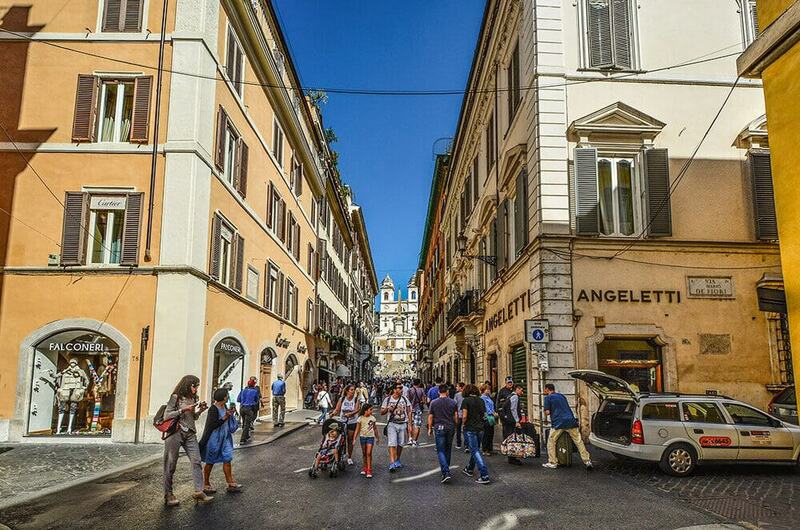 Via dei Condotti is the coolest shopping street in Rome. You will find all sorts of amazing brands, from Ferragamo to Max Mara, from Gucci to Burberry and Tiffany. Focus on taking pictures, or you’ll feel tempted to buy something that will cost you the next two months of rent! The walk is lovely, and yet because so many trips to Rome focus exclusively on the museums, you have no idea how many people don’t even know about Via dei Condotti. Unfortunately, as I mentioned earlier, even 4 days in Rome are not enough to see everything! But if you skip the day trip, you can definitely spend more time visiting the museums and historical buildings. As you keep walking you will find yourself at yet another one of the famous places in Rome, Piazza Navona. 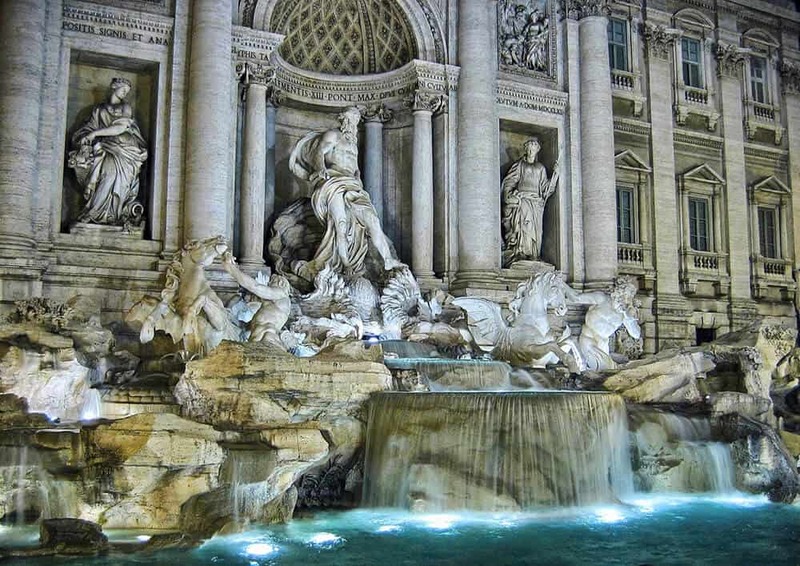 Once you’re here you can visit two beautiful churches, Sant’Agnese in Agone and Nostra Signora del Sacro Cuore, and take pictures of two fountains, Fontana del Moro and Fontana dei Fiumi (also Fontana del Nettuno if you’re not too tired). Here there are so many cool cafes and restaurants so I encourage you to dine here before you head back to your hotel! When visiting Via dei Condotti ask a friend to keep your credit card under lock! In case you’re planning a trip to Italy, you’ll probably already know if you want to stay the full 4 days in Rome or if you also want to add a day trip in between exploring the Eternal City. The options if you decide to stay and explore are a visit to Museo Nazionale di Castel Sant’Angelo, or to the Galleria Borghese, the Pantheon or even to the amazing Basilica di Santa Maria Maggiore, one of the four Papal basilicas of Rome. Cinecittà World – not often seen in an Italy itinerary, this theme park is dedicated to movies, but it’s heavily leaning towards the Italian production (a bit like Universal Studios Japan with the Japanese culture, but not as bigger!). 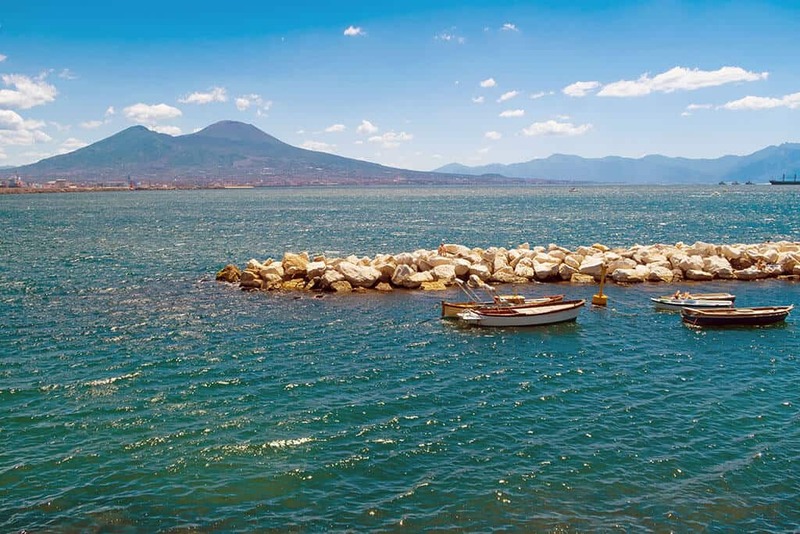 Even if you don’t have a car you can plan a day trip to Capri or the Amalfi Coast. Just make sure you pick a reliable company so you won’t have to worry about anything! Have a look at my list of the best Amalfi Coast tours: you will be surprised at how many places you can go to also from Rome! In the evening head over to Trastevere. There are so many things to do in Rome at night and most of them… you can find in this district. Located on the other side of the Tiber river, this district looks so different from the chaotic city center! Trastevere lits up at night, becoming a romantic area that always makes me think of La Dolce Vita. You don’t even have to walk too much to find a romantic restaurant: there are so many, hidden in the narrow streets of cobblestone! One of the best restaurants you can go to if you’re planning a romantic Rome itinerary is Zi Umberto. Ceiling with wooden beams, family owned, the scent of the good, traditional food. It’s one of the Italian experiences you can’t miss! In case you’re on a budget, have a look at Bir and Fud, which sells slices of pizza, beer and Italian supplì (deep fried rice balls). Another place to go to if you’re after a delicious pint of beer is the Birrifugio in Trastevere: they sell lots of different beers, both locals and international. Vatican City is an independent city-state within Rome. It’s the smallest country in the world and of course it deserves a full day visit. Vatican City entrance is of course free, and you won’t need any specific visa to enter. Be aware that there might be a long line to enter Vatican City, especially if you visit on a Sunday or if you plan to spend the Christmas in Italy: the midnight mass can be overcrowded! Not many people know that only part of Vatican City is open to the public: there’s a whole part of this city-state that is reserved to those who live and work there! To access Vatican City there are two main entrances: one is located near Piazza San Pietro (St. Peter’s Square), and another one not too far away from the Vatican Museums. Italian Police and soldiers will check your bags and you might be asked to step under a metal detector. If you’re getting there using the metro, the closest one is the red line (Linea A) that ends in Battistini. If you want to go to St. Peter’s Square your station will be “Ottaviano-San Pietro”. If you want to try the other Vatican City entrance, hop off at “Cipro-Musei Vaticani”. From the metro station you will need to walk for about 10 minutes to get to the security checks area. 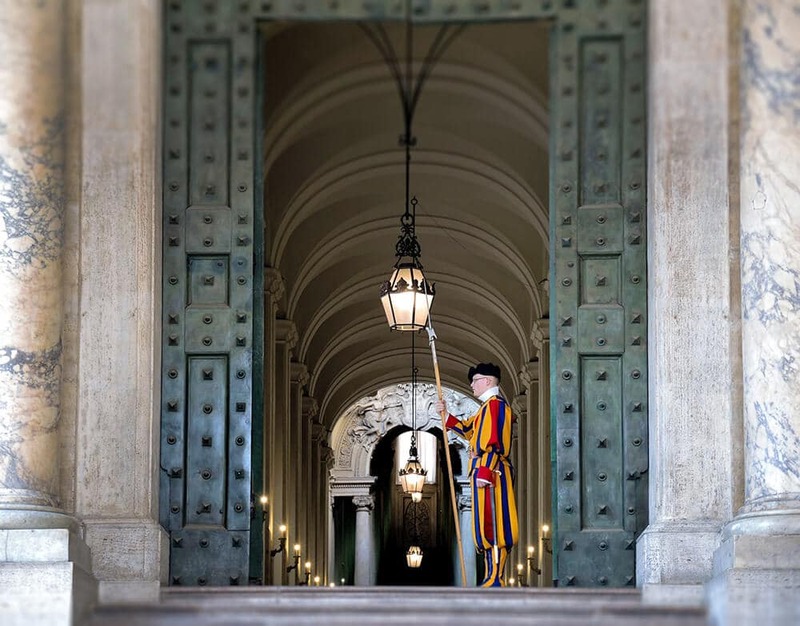 Looking for the most instagrammable spot in Vatican City? It’s the spiral staircase at the Vatican Museum! There are free activities in Vatican City, and a few others that you have to pay for. One of my favorite free things to do is visiting St. Peter’s Basilica. Of course, as it happens in every Church in Italy, you must be respectful when you visit and you have to dress up properly. Shoulders and legs will have to be covered, even if it’s the warmest summer day ever. In case you are wearing shorts or mini skirts they won’t let you in. To avoid problems, bring along a cotton shawl or something like that, so you can put it on your shoulders before to get inside. 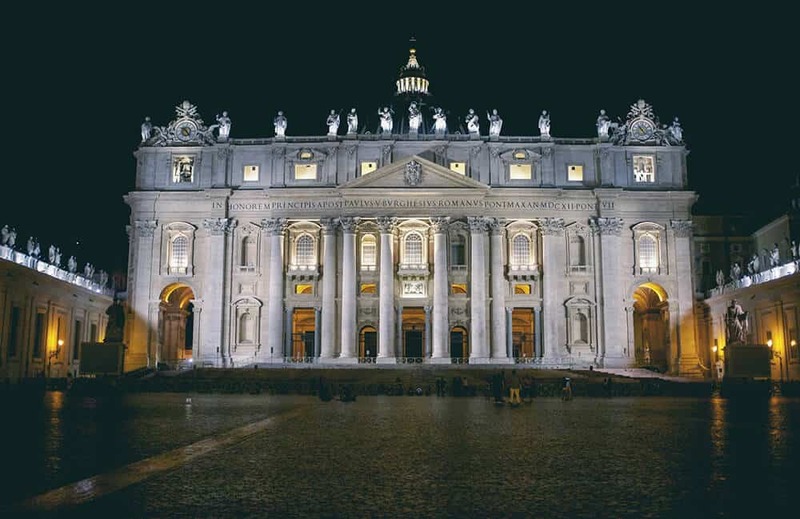 The entrance to St. Peter’s Basilica is free (St. Peter’s Basilica hours are from October 1 to March 31 from 7:00am to 6:30pm; from April 1 to September 30 from 7:00am to 7:00pm), but if you want to access the dome you will need to buy an entrance ticket. Elevator plus 320 steps will cost you 8€, while if you want to climb all the 551 steps (which is a lot! ), the ticket will cost you 6€. While the view from up there is amazing, this isn’t an experience for everyone. The last part is a very narrow staircase. Being terrified by the heights, I almost got a panic attack up there. I knew it is safe and my husband was with me, but it still happened. While I managed to calm down, it might not be so easy for someone else. So please take into account that the last part is not for the faint of heart. If you can’t complete the visit they still won’t return the money! Of course St. Peter’s square is another must see in Rome (well, technically in Vatican City): you can just walk around taking as many pictures you want. 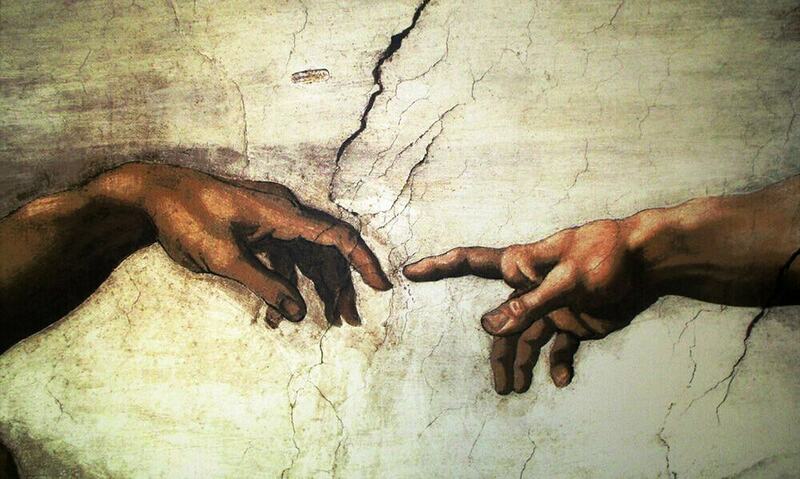 What people commonly call “Vatican Museums” are actually a group of museums located in Vatican City. There are over 54 galleries that you can visit, and the lines can be quite long. If you want to visit (and you definitely should), it is mandatory to get to the entrance early in the morning, so you won’t be wasting precious time in line. Several ticket combos are sold online. The Museums and Sistine Chapel ticket for a guided tour costs 41€, while the self guided one costs 17€. 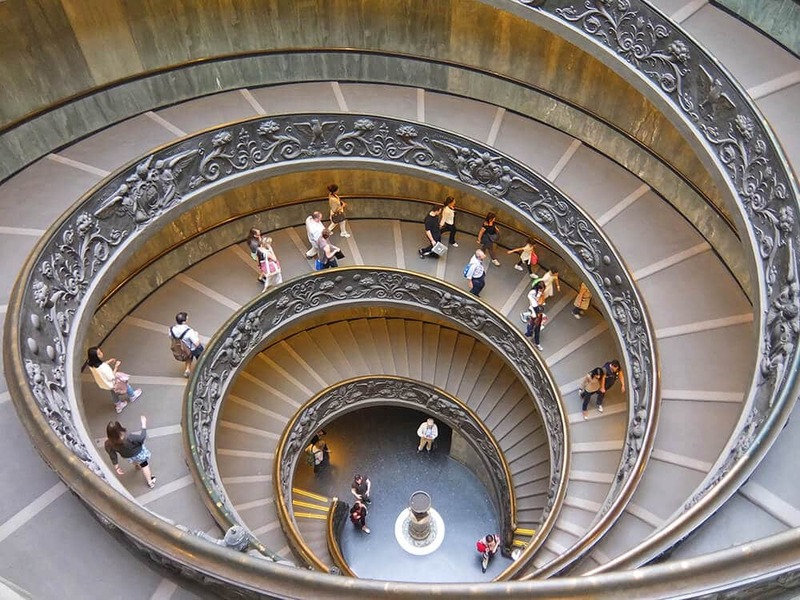 Vatican Museums are open from Monday to Saturday from 9:00am to 6:00pm (last entry at 4:00pm), and every last Sunday of the month from 9:00am to 2:00pm (last entry at 12:30pm). In case you planned your 4 days in Rome are in spring or summer, I suggest you also plan a visit to the Papal Villas. Guided tours start at 45€. You can visit Villa Barberini and its garden or the Apostolic Palace of Castel Gandolfo. They even sell a guided bus tour for 36€ per ticket (it doesn’t include access to the Vatican Museums). Since visiting Vatican City will take you one full day, you’re probably going to get back to Rome in the evening, right on time for an aperitivo or maybe for a full dinner, according to how hungry you are. I’ve already showed you a few things to do in Rome at night and areas you should go to have dinner. So for your last night in Rome, by all means, go to Ponte Milvio (Milvian Bridge)! This bridge over the Tiber in the Northern part of Rome has become a popular spot for couples in love. For years, after the release of the popular book and movie Tre metri sopra al cielo, couples started to attach padlocks to a lamppost on the bridge, then they threw the key into the Tiber. Because of this practice, the lamppost partially collapsed in 2007 due to the added weight. Now there’s a fine for those who do it. Yet even if there wasn’t a fine, I still wouldn’t agree with this practice: is a padlock worth ruining a monument? So also if without adding a padlock, you can still have a romantic walk at Ponte Milvio. The area is in fact full of nice little restaurants and cafes open until late at night. One of the best is Gli Specialisti, which cooks all the best traditional Roman dishes. If you want to dine on a budget, try the Trapizzino. They have amazing street food, it’s a mix between a sandwich and pizza. So you will be served this sandwich full of the best sauces, or even delicious meatballs! 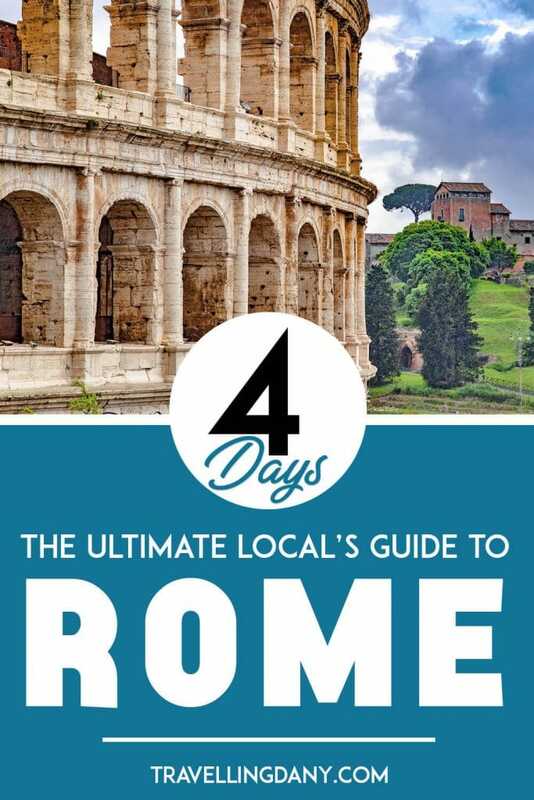 Did you like my Rome itinerary for 4 days? Let me know in the comments if you’ve used it for one of your trips to Rome, or if you need more info. I’ll be glad to help! here you can also find our review of Hampton by hilton rome east: it might be useful to decide where to stay! Good to see Romulus and Remus getting chow Danila 😉 Excellent guide. Haha well wolves are not the bad guys people think! 😀 Thank you Ryan I’m glad you like it!